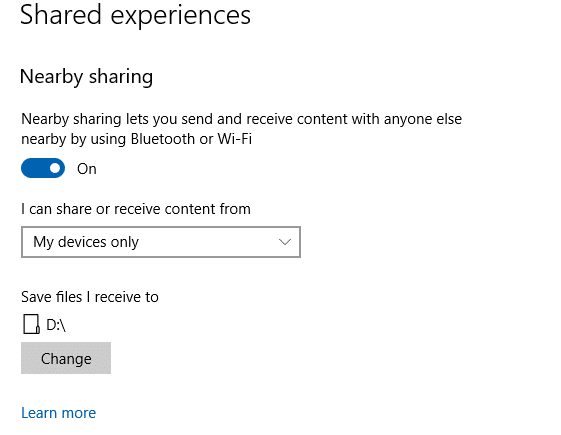 With the Windows 10 April 2018 update (version 1803), there is now a feature of Nearby sharing. This feature makes it very easy to transfer files between different Windows 10 PCs without setting up a network. It does this by using Bluetooth or a Wi-Fi network. There are other useful Bluetooth features too that Windows 10 makes use of like Dynamic Lock. 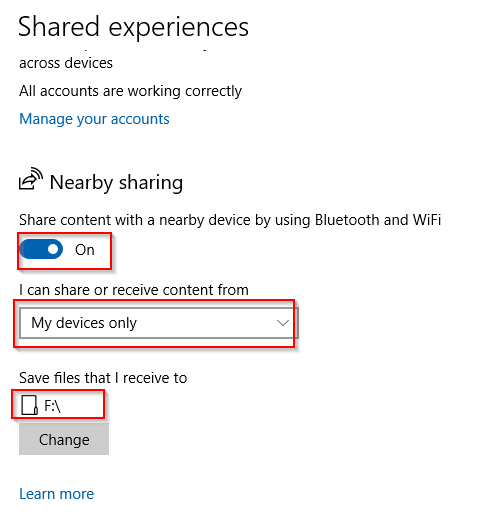 The prerequisite for Nearby sharing is that the PCs have Windows 10 version 1803 or higher and Bluetooth support if transfers are to be done using that. To know which Windows 10 version the PCs are running, open Run box (Windows key + R) and type winver. This will display the Windows 10 version number. 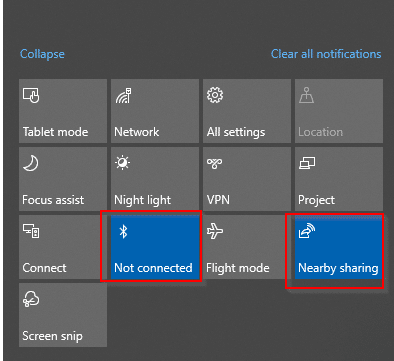 Here is how to use Nearby sharing for Windows 10 PCs through Bluetooth. 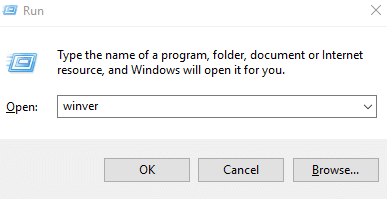 On the source PC, go to Settings (shortcut: Windows key + I) and choose System. Then scroll down to Shared experiences and enable the options for Nearby sharing. 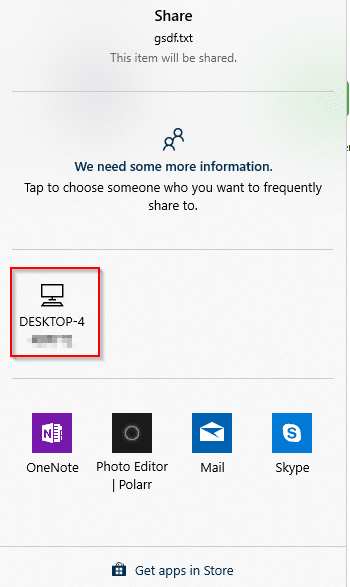 You can choose either sharing for Everyone nearby (thereby making your PC visible) or just My devices only. Also the default destination path where the files will be received can be changed from Save files that I receive to option. 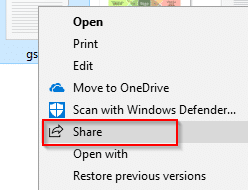 Repeat the same for the destination PC which will use Nearby sharing. Next, enable Bluetooth and Nearby sharing for both the PCs. This can be done from the Action Center itself from the system tray. 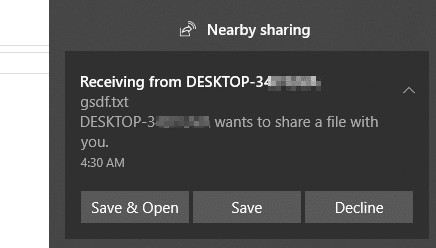 Now, to send a file, right click on it and choose Share. There will now be an option of sending it to the destination PC which will be listed there. 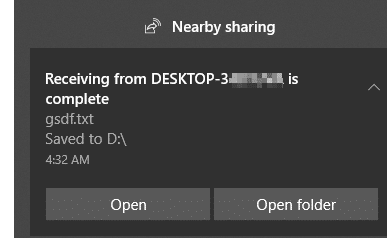 Click on it, the destination PC will now get a notification of incoming file transfer. Choose Save or Save & Open as needed. Once the transfer is complete, you can view the files in the destination path as set in Nearby sharing. Really nice post. Thanks for providing such a nice information.